Has you wallet, handbag, mobile phone or even your bike been stolen? 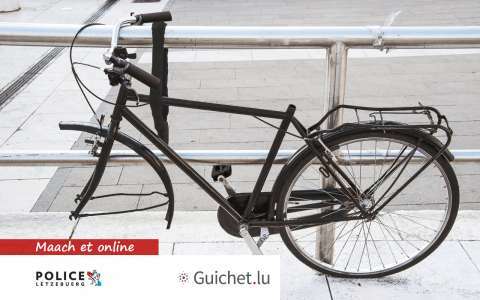 You can now file a complaint online via MyGuichet.lu. You are required to state if you are filing a complaint in your name or for a person under your responsibility (your child). You also have to provide certain information such as the circumstances of the theft, the stolen objects (category, description) as well your personal contact details and eventually those of the victim. In order to facilitate the investigator's task, you can add pictures or purchase receipts of the stolen objects. You will receive an electronic copy of the hearing. However, the copy cannot be used as an official certificate for insurance purposes. You may only use a copy of the transcript of the hearing, which you will also receive.